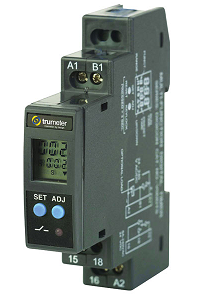 The Series MCS Miniature Current Switches are ideal for monitoring the current usage in fuse boxes and small control panels. Both models have adjustable set points and LED indication to show there is power to the unit and when the switch activates. Set points can be adjusted using the potentiometer next to the LED’s. Due to the size of the switch, it is only offered in solid core and no core versions. The no core version has terminal blocks which can accept currents up to 1A directly into the unit.